CAMERON, GEORGE FREDERICK, poet, lawyer, and journalist; b. 24 Sept. 1854 in New Glasgow, N.S., eldest son of James Grant Cameron and Jessie Sutherland; m. 22 Aug. 1883 Ella Amey, and they had one daughter; d. 17 Sept. 1885 at Millhaven, Ont. George Frederick Cameron received his early education in New Glasgow and appears to have excelled in both academic and athletic pursuits. An early love affair was disrupted when George moved with his family to Boston in April 1869. The young couple nevertheless considered themselves engaged and corresponded regularly. For three years Cameron devoted much of his energy to writing on the subject of freedom, especially the struggle which was taking place in Cuba. He contributed poems and articles on this struggle to local newspapers and journals. In 1872 news that his fiancée was engaged to another suitor, whom she later married, seriously affected George’s physical and emotional health. Two years later, returning to Boston after a recuperative vacation, he learned of the death of his former fiancée and travelled to Nova Scotia to visit her grave. The stress of these years provided the material for much of his early poetry. Cameron returned to Boston in the autumn of 1874 and enrolled in the Boston School of Law. He graduated in 1877 at the head of his class and entered the local firm of Dean, Butler and Abbot. During his five years with the firm he continued to submit literary pieces to local journals. In June 1882 he left Boston and in the fall of that year enrolled in Queen’s College in Kingston, Ont. 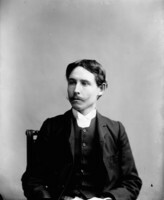 Although he did not excel at his studies, he was a member of a group of poets at Queen’s which included Thomas Guthrie Marquis*, and he won the poetry prize at Queen’s in 1883 for “Adelphi.” In March of the same year he left the university to become editor of the Daily News in Kingston. He held this position, and continued to write poetry, until his early death, of heart failure, two years later. A selection of his verses, Lyrics on freedom, love and death, was published posthumously at Boston and Kingston in 1887 by his brother Charles John Cameron, whose laudatory preface has provided the basis for subsequent biographical notices. Charles also published Cameron’s libretto for a military opera, Leo, the royal cadet, which appeared in 1889 over the joint names of George and composer Oscar F. Telgmann. The opera, set at the Royal Military College of Canada in Kingston, is a light-hearted piece about love and war, faintly reminiscent of Gilbert and Sullivan and the contemporary Savoy operas. It was performed in 1889 in Kingston and several other Ontario cities. Of Cameron’s published verse, his juvenilia, “Lyrics on freedom,” have not outlasted their political occasions; his “Lyrics on love,” indicative of the influence of several real or imaginary emotional upheavals, are brooding, melancholy, and misogynic; his “Lyrics in pleasant places and other places” and “Lyrics on death” commemorate personal impressions. Cameron modelled himself poetically after Sappho and Shelley but owed most, especially in the two longer poems in Lyrics, to the young Tennyson. “Adelphi” is a verse tale of the affections of two brothers for the same woman to the point of self-sacrifice in the manner of Tennyson’s “Enoch Arden.” “Ysolte,” the highly imaginative account of an unhappy love, resembles Tennyson’s “Maud.” It demonstrates, in tone and substance, the duality of Cameron’s attitude to life, which he sees throughout his work in extremes of love and hate, romance and truth. The melancholy in Cameron’s poetry was in part the conventional elegiac mood evident in the more sombre poems of Lampman but was also attributable to the genuine emotion of a man who suffered deep depression. His work on the whole is metrically competent and introspective, forsaking originality in imagery and emotion for a fondness for conventional poetic diction which romanticizes events of little lasting appeal and thus does not rise above the level of verse. Cameron’s reputation has suffered most from later uncritical panegyrists who praised him for what they would have liked him to be rather than for what he was: a competent verse writer representative of his time. G. F. Cameron’s poetry can be found in Lyrics on freedom, love and death, ed. C. J. Cameron (Kingston, Ont., and Boston, 1887; repr. Toronto and Buffalo, N.Y., 1973), and in Later Canadian poems, ed. J. E. Wetherell (Toronto, 1893); with Oscar F. Telgmann he wrote An entirely new and original military opera in four acts, entitled: Leo,. the royal cadet ([Kingston], 1889). QUA, Richard Albert Wilson papers. A. S. Bourinot, Five Canadian poets . . . (Montreal, 1954), 22–26; “George Frederick Cameron,” Canadian Author and Bookman (Toronto), 29 (1953–54), no.4: 3–5. L. J. Burpee, A little book of Canadian essays (Toronto, 1909), 73–87. S. W. Dyde, “The two Camerons,” Queen’s Rev. (Kingston), 3 (1929): 196–98. E. C. Kyte, “George Frederick Cameron,” Educational Record of the Province of Quebec (Quebec), 63 (1947): 117–22. Archibald Lampman, “Two Canadian poets: a lecture,” Univ. of Toronto Quarterly (Toronto), 13 (1943–44): 406–23. J. M., “Who’s who in Canadian literature: George Frederick Cameron,” Canadian Bookman (Toronto), 13 (1931): 179–80. Geoffrey Vivien, “A forgotten Canadian poet,” Canadian Author and Bookman, 23 (1947), no.3: 57. Alexander H. Brodie, “CAMERON, GEORGE FREDERICK,” in Dictionary of Canadian Biography, vol. 11, University of Toronto/Université Laval, 2003–, accessed April 19, 2019, http://www.biographi.ca/en/bio/cameron_george_frederick_11E.html.